Matt Cummiskey with his wife Kathy and daughter Abby. A routine hair appointment may have saved the life of an Oxford mother of three in March, and now she and her family are dedicating themselves to raising money for melanoma research. A consultation at the Abramson Cancer Center at the University of Pennsylvania brought the situation into focus. “I was all nervous about the appointment, but he ended up passing out,” she said, glancing over at Matt, who nodded. “I was very stressed about the situation,” he said. “They started to describe the procedure, where they had to lift up her scalp. I started getting very lightheaded and passed out,” he said, smiling. “He made the day less stressful on me, because I could laugh about him,” Kathy said. 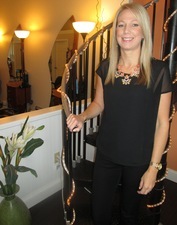 Deedree Erlichman, of Texture Salon in Oxford, found the melanoma on Kathy Cummiskey's scalp during a haircut in March. A biopsy revealed that the spot was melanoma. On April 21, Kathy had a three-hour surgery that involved removing the spot and several of her lymph nodes. The resulting scar runs from Kathy's hairline to the top of her skull, but is hidden by her hair. The lymph nodes were clear of cancer, but Kathy goes to the dermatologist every three months now, and gets an ultrasound of her head and neck every four months to make sure that the cancer does not spread. If the cancer had not been caught early, “It could have gone to other organs – lungs, brain, liver. It's an aggressive cancer,” Kathy said. The upheaval of the past several months has affected the couple and their daughters, Hannah, Bridget and Abby, who have joined the Kat Pack, a group of family and friends who will be walking in the Aug. 16 Miles for Melanoma 5K run/walk at the Philadelphia Zoo. They are already well on their way to raising their $5,000 team goal. The lessons they've learned about melanoma and the people they've met will be part of their lives from now on, Matt said. They plan to be involved with fundraising efforts forever. 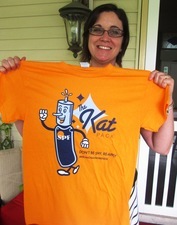 Kathy Cummiskey with the T-shirt designed for the Kat Pack team. Their youngest daughter Abby, a student at Penn's Grove Middle School, said she also is more aware of the damage the sun can do, and she is an enthusiastic supporter of the Kat Pack team. “Your skin is the largest organ, so if you get skin cancer, it's a big problem,” Matt said. In addition to the 5K event, there's a fundraiser on July 21 from 6 to 10 p.m. at the Ugly Mutt in Oxford. A neighbor of the Cummiskeys will be playing music at the event, and there will be raffles and a 50/50. Since April, “all of our friends have made appointments to be checked,” Kathy said. For more information, visit www.melanoma.org/get-involved/miles-for-melanoma/5k-runs-walks.